Today is the last day of a summer camp project I am facilitating, which is connecting inner-city middle school students with the Springfield Armory, a National Park Historic Site. (The project is funded and supported by our Western Massachusetts Writing Project, Mass Humanities, The National Writing Project, the Springfield Armory, Veterans Education Project and the Springfield City Schools … it’s a complicated endeavor, to say the least). The middle schoolers (who come from a Social Justice-themed school) are now hard at work on a research project, in which they have taken on the “persona” of someone from the Armory’s past (our focus has been women and immigration), and represent what they know through a multi-genre effort. One piece is writing, and another is more art-related. To show students what we are thinking when it comes to multi-genre, another teacher and I both created some texts. She wrote, and performed, an amazing rap song (she used to work for Flocabulary, I found out) about women in the workforce during World War 2. Meanwhile, I decided to use what we learned about Rosie the Riveter in a presentation by a historic re-enactor to create two different projects about Rosie. 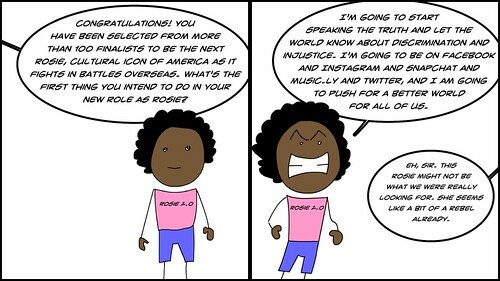 My premise was, what would a Rosie icon look like today? First, I wrote a Poem for Two Voices, and had students come up and read it with me. 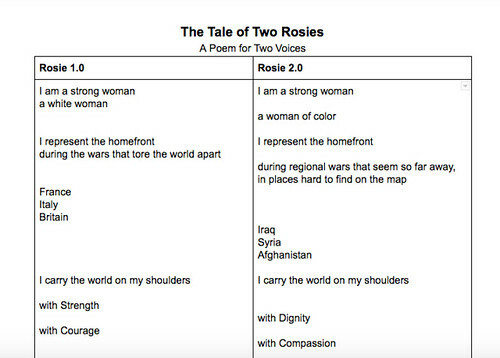 In the poem, the two voices were Rosie 1.0 (the original icon) and a Rosie 2.0 (a modern day icon). 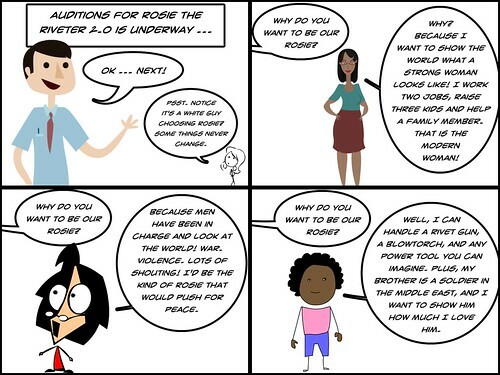 Second, I created a comic strip in which woman are auditioning for the job of Rosie 2.0, and what happened when a strong, active woman gets the part. (OK, so I didn’t reference the Trump administration, but I imagined them being the voices off in the wings). This entry was posted in comics, WMWP. Bookmark the permalink. Thanks Kevin. Enjoyed the video, cartoon and the post. Thanks, Daniel. It all went well.